KIEV, Ukraine -- Ukrainian President Petro Poroshenko on Wednesday proposed constitutional changes giving sweeping powers to the regions but critically failing to address demands of pro-Russian militants in the separatist east. U.S. Senators Tom Cotton, John McCain and John Barrasso during a joint press conference in Kiev, Ukraine, 20 June 2015. U.S. 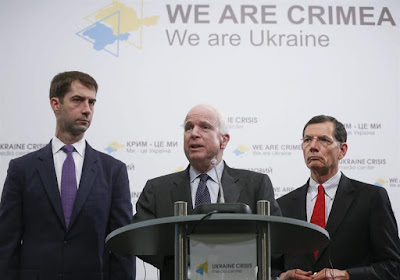 Senators John McCain, Tom Cotton and John Barrasso visit to Ukraine to talk with President Petro Poroshenko, Prime Minister Arseniy Yatsenyuk, political leaders and representatives from Ukrainian civil society. Poroshenko's new vision of the ex-Soviet state's basic law trims presidential controls over the provinces and extends to local towns and councils the right to oversee how their tax revenues are spent. But it also refuses to add to the constitution the semi-autonomous status demanded by insurgency leaders who control an industrial edge of Ukraine that is home to 3.5 million people and accounts for a tenth of its economic output. "The president is not ready to inscribe (the separatist regions') separatist status in the basic law," said International Centre for Policy Studies' analyst Anatoliy Oktysyuk. "This carries huge political risks for the authorities. It is an unpopular decision that would open the entire presidential coalition in parliament to criticism." The westward-leading leader -- elected in the wake of the February 2014 ouster of Russian-backed president Viktor Yanukovych -- said the amendments would decentralise power but never turn Ukraine into a loose federation that Moscow has sought. "Decentralisation would bring our political system closer to that of Europe," Poroshenko said in a nationally televised address. He argued the changes -- still to be approved by parliament -- would hand locally-elected administration leaders and councils "a vast amount of rights and financial resources that today are overseen by the president and the government." "Decentralisation safeguards us from authoritarianism and dictatorship," said the 49-year-old former business baron. "Decentralisation will be our civilised distinction from our neighbours in the Soviet camp," he added in apparent reference to Russia and Belarus. Rebel-controlled parts of the mostly Russian-speaking Lugansk and Donetsk regions would like to see their semi-autonomous status spelled out in clearly-defined constitutional amendments that would be enormously difficult to overturn. But Poroshenko's draft only makes reference to an existing piece of legislation that gives insurgency leaders partial self-rule for an interim period of three years. The separatists fear that the law could be revoked or suspended by Ukraine's strongly pro-European parliament. "None of these changes were agreed with us in advance," separatist leader Andrei Purgin told Russian news agencies. Kiev's Western allies have long pushed Poroshenko to loosen the central authorities' dominant role in Ukrainians' lives. Washington believes regional rights would make politics more transparent and help break the corrupt bonds forged in the past two decades between decision-makers and tycoons. But Moscow has argued that only a "federalised" Ukraine in which regions form their own diplomatic and trade relations with other nations can finally end a bloody revolt that has claimed more than 6,600 lives in 15 months. Poroshenko has expressed concern that such rights could see the two main separatist regions block Kiev's attempts to join the European Union and apply for eventual NATO membership. Militias in control of swathes of the war zone -- now strewn with landmines and the smouldering remains of coal mines and steel mills -- have cut ties with Kiev and receive humanitarian and diplomatic support from Moscow. They and the Kremlin both fiercely deny the presence of Russians soldiers and arms on their lands. But insurgency commanders still stage periodic attacks aimed at expanding their holdings far past the heavily fortified frontline. An AFP team in the frontline city of Horlivka -- home to nearly 300,000 people who depended on the local coal mine before the war -- heard intense overnight shelling that forced the remaining residents to seek shelter in basements for the second consecutive week. "We do not know who is doing the shooting. It comes from all sides", said a 49-year-old resident who identified herself only as Alla out of security concerns. If the rebels "decide to continue attacking, we will have a lot of victims. We need a peaceful solution", she said.